Water supply by Himalayan mountains to increase in decades ahead - Integration Through Media ....! KATHMANDU: Despite retreating glaciers, the amount of water supplied by the Himalayan Mountains will increase in the coming decades, a study from FutureWater, Utrecht University and the International Centre for Integrated Mountain Development (ICIMOD) suggests. 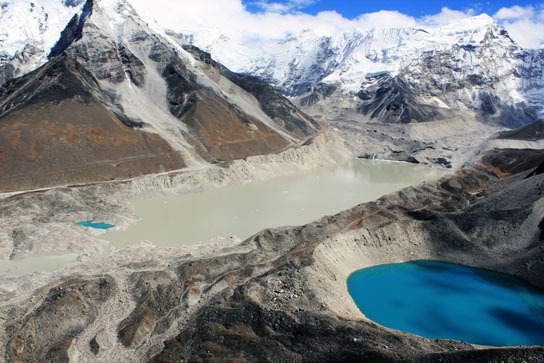 Glacier- and snowmelt contribute water to ten important river basins originating from the Himalayas and in the Tibetan Plateau serving over 1.3 billion people, the study shows. A group of scientists assessed the importance of meltwater for the Indus, Ganges, Brahmaputra, Salween and Mekong rivers and discovered how climate change will alter river flow in the coming decades. The findings of the study will be important in shaping climate change adaptation policy in the twelve riparian countries surrounding these river basins, informed ICIMOD. The scientists used a new model to study the entire river basins in unprecedented detail. “Our results show that the river flow will increase at least until 2050, despite retreating glaciers,” says Arthur Lutz, a researcher at FutureWater and a PhD candidate at Utrecht University. The scientists emphasize that their projections are only for until 2050. Scenarios for the distant future, or until the end of the century, remain uncertain, in particular for the Indus River where meltwater is most important. The findings are part of a larger research programme titled Himalayan Climate Change Adaptation Programme. Their findings will be published in Nature Climate Change on 1 June 2014.